If you’ve been dreaming of a great mountain vacation, Dream Weaver is the place to make it come true. This cabin nestled in the woods offers long-range mountain views and a carefree, laidback atmosphere. 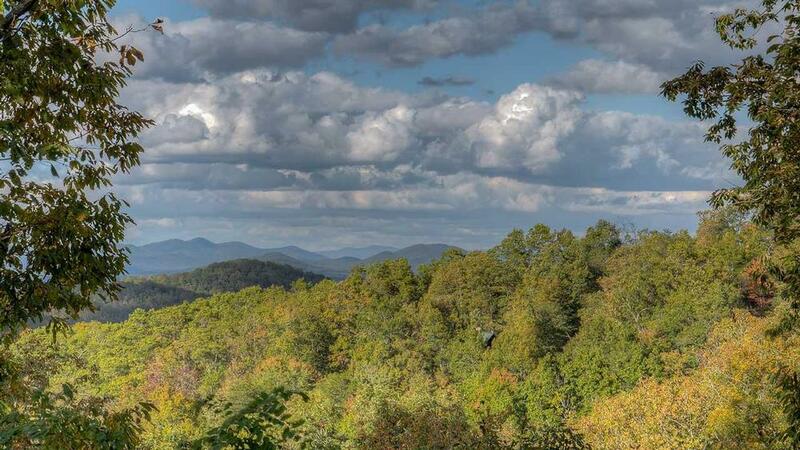 It’s a smooth and easy trip from downtown Blue Ridge, with a paved road and driveway leading up to the cabin. This dream destination features upscale furnishings with wildlife-themed décor and honey-hued wood throughout. Three stacked stone fireplaces adorn the living area, game room, and outdoors on the lower porch, offering a cozy, stylish setting no matter where you are. Spend the morning taking it easy, planning out the activities for the day. Flip some pancakes in the fully equipped kitchen, which has every amenity you’ll need for a luxury vacation. When you’re ready for the adventure to begin, rent a boat or jet ski, or swim the pristine waters of Lake Blue Ridge. Go whitewater rafting on the Cartecay, Nantahala or Ocoee, or spend the day fishing or floating down the Toccoa in a tube. Head to Mercier Orchards for a wagon ride and the best fried pies around. For a little nostalgia, take the Blue Ridge Scenic Railway or see a movie at the Swan Drive-In. Back home, grill some burgers out on the deck and have dinner on the screened-in porch or picnic table below, then relax afterward on an Amish rocker or chaise lounge with a cocktail, watching the sky’s changing colors. Wind down from your fun-filled day in the delightful game room downstairs. Make your guests a drink at the wet bar, grab a snack from the mini-fridge and play some pool or board games. Feel your cares melt away as you unwind in the hot tub in front of the glowing fireplace. Or make s’mores by the fire pit and share some laughs under the twinkling sky. Sweet dreams are guaranteed here. Three charming bedroom suites welcome you, each with king-sized bed with their own private bathroom. Climb the beautiful mountain laurel staircase to the master bedroom suite for a soak in your own Jacuzzi tub, or enjoy the privacy of your own special deck. From the main floor bedroom, you can also step out to the screened-in porch for a last look at the stars. Conveniently located just 90 minutes north of Atlanta and 90 minutes south of Chattanooga, Dreamweaver is a true treasure among North Georgia cabin rentals. This peaceful retreat amongst the trees is the perfect setting for weaving dreams and memories with family and friends. 12/18 - This home was immaculate and extremely inviting. We felt at home immediately. I plan on purchasing a cabin in Blue Ridge several years from now. I will be contacting you as my management company. There were extra touches that I felt were welcoming for potential renters. 10/18 - This home felt like home! Cozy, welcoming and safe! I usually get pretty spooked while in the woods, but this cabin just felt so safe to me. The house is well built, well decorated and taken care of. 5 stars! Wonderful, professional and friendly staff. Attentive, super kind, easy to talk to and accommodating. We are long time repeat customers and Escape to Blue Ridge is the only cabin rental company we use when we come to Blue Ridge. 08/18 - The cabin was so beautiful. We loved the abundant amount of games, the hot tub, billiards and the king size beds. I loved everything about the company. 07/18 - Beautiful location and good set up for entertaining family. 4/18 - Privacy, views, cleanliness, "as pictured," great overall. Everyone was very eager to help and assist. 2/18 - My first time ever in a cabin and it was amazing. Everything was very beautiful. And everything we needed was right there. Just like home. Can’t wait to return!! Caring. Helpful. Welcoming. 2/18 - Excellent location with great mountain views. Hot tub was great. 09/17- Most everything needed was there. Recliner chair worked perfectly as requested, thank you! Answered all questions and concerns. 09/17- The bedrooms were very nice. Kitchen well stocked with utensils. Easy to get to and close to town. Repeat customer. All good. 07/17- Everything was wonderful. Secluded and got the cabin and mountain experience we were looking for. Professional and easy to work with. Emails and directions were straightforward. 06/17- Dream Weaver was perfect!! We enjoyed the view, playing pool, the hot tub, the location close to everything, the overall decor of the cabin and the birdhouse!! (We bought one!!). This was our first time renting with your company and it wont be the last. Our reservations were smooth and easy and the phone representative was very easy to talk to. She knew what our wants were and recommended a few beautiful cabins to choose from. The pictures were exactly what we got. Checkout was simple and easy as well. 04/17- The views of this wonderful cabin had me intrigued from the moment I got there until we left. Great staff. Everything that you needed was at your fingertips. 12/16- All of the amenities were available to us, even if the weather didn't cooperate! You thought of everything down to the corkscrew (which we forgot to bring)! Very professional, thoughtful, well-managed. 11/16- Really enjoyed the deck and outside fireplace. The staff were pleasant and helpful. 10/16- This home was very clean and had everything we needed! Great company! No need for change!! I would add more cabins, I think we got the very last one you had available! Lol! 09/16- We loved how comfortable the home was and the amount of space. Everyone was phenomenal, knowing exactly what to suggest and how to make us most comfortable. We had a wonderful time. Would definitely recommend Escape to Blue Ridge. 08/16- Everything about Dream Weaver was beautiful. 07/16- I ENJOYED THE LAYOUT OF THIS PROPERTY, IT ALLOWED EACH FAMILY TO HAVE THEIR OWN SPACE AND ACCESS TO THE ACTIVITY ROOMS. THE SCREENED PORCH WAS A PLUS. 07/16- Very clean. Liked the welcoming feel with music playing when we entered. Plenty of towels and wash cloths available. A lot of detail and care. 07/16- The house was clean, the beds comfortable, and the view from the porch was beautiful. 06/16- This home was wonderful! It was beautifully decorated and extremely clean. The porch was amazing and the whole place felt like home. We can't wait to go back! 05/16- We loved the view, the fireplaces, the hot tub, 3 private levels to enjoy & fantastic time on the porch. 04/16- Perfect sleeping arrangements for three couples. Loved the fireplaces and the screened in porch. 03/16- The cabin really met our expectations. It was our first time visiting the area and we really enjoyed this vacation. The cabin had everything we needed. The view was beautiful and we loved the screened decks. I am very pleased with the service that your company provided before and thought-out our stay. 03/16- It was Awesome! Full of things to do. Beautiful view. The kitchen had everything you needed. This was the first time we used the company or stayed at Blue Ridge. The website, booking,etc. was very streamlined and easy. I thought it was a little pricey, but it was a very high end cabin!We will definitely be back! 02/16- Enjoyed the way the floors were set up and decks on all floors. Great view. Staff was friendly and very helpful. 01/16- Loved the hot tub, pool table and gas fireplaces at the various levels. LOVE working with Escape to Blue Ridge!. Our second time renting and everyone is so helpful and quick to respond to our needs or questions. Gabby was wonderful, answered our questions and came out to the cabin to help us with the hot tub! 12/15- We really enjoyed everything the cabin offered... the well stocked kitchen, comfortable lines, dÌÄå©cor, fireplaces on each level and most of all the screened in porches. Your company and the few employees we spoke to over the phone were very nice and professional. We are use to entering an office to sign paperwork, pick up the cabin keys, etc. We reserved everything on line, quick and easy. Once we arrived to the cabin and noticed the gas grill did not work we called and someone came out in less than 20 minutes... excellent service!! The cabin looked exactly as it did on line!! 12/15- Love that all the bedrooms had King size beds. The bar downstairs came in very handy. The decor of the cabin was beautiful. We loved the 3 gas fireplaces and very open kitchen. 11/15- All 3 gas fire places, the nice sized kitchen and dining table, and the 3 King Sized Beds were our favorite features. This is our second year visiting Blue Ridge and using your company. You have made it very easy for us to take a vacation and feel comfortable renting any of the homes you offer. Thank you! 11/15- Loved that all bedrooms had king sized beds. That suited our needs perfectly. 10/15- We loved the location, the hot tub , the pool table and well stocked kitchen. 10/15- The amenities in the home were great!! Very great company awesome customer service. 10/15- We really enjoyed the pool table and the hot tub. The master bedroom was amazing having a personal deck attached and master bathroom with spacious shower. This was a great company to deal with. Usually when I rent cabins I have to go through so much for my rental. Calling to verify, picking up keys to property, hard directions, Internet not working (it's 2015 gotta have wifi now days)...etc. this company was no hassle. Stress free! 08/15- Clean, large, beautiful , functional. Escape to Blue Ridge was great to work with. 06/15- Quietness of area. Company is very helpful and accommodating. 02/15- We can't decide what our favorite was. It was all wonderful! Cabin and all services were fantastic. Everyone I dealt with were efficient, helpful and friendly. Overall impression was great and have recommended company to friends and family! 12/14- The master bedroom & bathe were our favorite features. We were WOWED from beginning to end and much more than expected. 11/14- Cleanliness, view, pool table, hot tub, fire places, comfort, beds, porches and kitchen supplies were great. 11/14- Spacious, well appointed and stocked. Very nice location. Top notch service. Outstanding details and awesome stay. 11/14- The basement and the hot tub were awesome. I was really impressed. Everything was so clean and the cabin was beautiful. We will definately be renting from your company again. 10/14- The home was beautiful, very well built and decorated. It was also very clean I even left a tip for the cleaning staff for doing such a wonderful job!! Very nice cabin, clean and we were provided with lots of info and maps of the surrounding area and attractions! 10/14- The bedrooms were very comfortable. We all loved the outdoor space on the covered decks. The kitchen was well equipped. We did a lot of cooking. The grill was great ! 10/14- Fireplace, master shower, porches, hot tub, game room were our favorites. We've stayed in 2 cabins in 2 different areas and both were wonderful, they made our trips so much more special, felt like we were living in the lap of luxury! Can't wait to try another cabin! 09/14- outdoor fireplace, hot tub, decks were great. The team did a beautiful job preparing the cabin. All the rooms were spotless, the cabin was pristine, the sheets and towels were all high quality. 08/14- I loved everything about this cabin. Too hard to choose just one favorite thing. Everywhere I turned it had something nice and you could tell the homeowner thought of everything. 09/18 - This cabin is a terrific get-away. Very clean with great amenities. Hot tub, pool table, king beds, fire pit, etc. Very comfortable and roomy. Has everything you need for a great enjoyable stay in the mountains. Just far enough from town to be quiet yet close enough to enjoy downtown easily. No issues at all. Cabin was ready when we arrived and very clean.